Prestressed concrete is a material that has had internal stresses induced to balance out, to a desired degree, stresses due to externally applied loads. The initial load or ‘prestress’ is applied to enable the structure to counter the stresses arising during its service period. The prestressing of a concrete structure is not the only instance where prestressing is used. There are few other examples which can be seen in day to day life. The metal bands induce a state of initial hoop compression, to counter the hoop tension cause by filling of liquid in the barrels. The pre-tension of a spoke in a bicycle wheel is applied to such an extent the there will always be a residual tension in the spoke. How Does Prestressing Concrete Works ? As remedy, a steel cable is passed through the concrete, reinforcing it against the tensile force acting upon it. Now, to increase the concrete's strength further, the steel cable is stretched by applying pulling forces to it at both the ends. Prestressing makes concrete exceptionally strong as far as tensile strength is concerned, allowing it to bear large loads without bending or cracking. There are basically two main methods are used for making prestressed concrete. a. This is the most basic method. b. In this method steel is tensioned before the placement of concrete. c. High strength steel strands known as tendons, are first brought under tension by pulling them at both ends. Concrete is cast around them and allowed to cure (harden). During the curing process, concrete bonds with the steel, and so when later the pulling forces are removed, as steel tendons return to their original shape, the bonded concrete too gets pulled together, resulting in its compression and hardening. a. Pretensioning requires strong anchor points to hold tendons while stretched. Such points are not always available on-site. b. 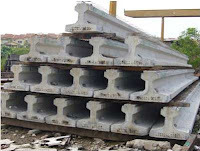 Most pretensioned concrete parts are manufactured at one place or in factories and transported to construction sites. 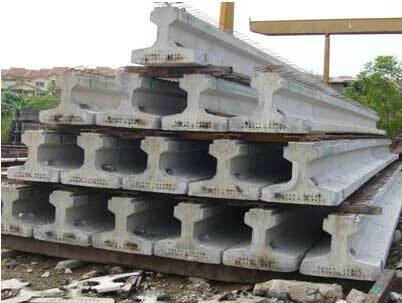 This imposes a limitation on the size and weight of the prestressed concrete parts. c. This technique is used for the construction of balconies. Floor slabs, piles, and even some bridges. a. In this method, first, the concrete placement is done, and tension is applied to the steel cable later when the concrete hardens. b. This technique can be employed to tension concrete on-site. c. To understand this process, imagine a series of wooden blocks, each having a hole at their center. If one passes a rubber string through these holes, and holds its ends, the wooden blocks will sag down. Now, if one fixes winged nuts to both ends of the rubber string, and starts winding it, the blocks will be drawn closer until they align themselves in a straight line. This is the basic principle of post-tensioning. a. Concrete forms a bond with the steel cable before it is tensioned. b. High strength steel cables (tendons) are passed through ducts made in the slabs of concrete. c. Stressing jack is used to tension the steel tendons. The steel tendon gets elongated while the concrete is compressed. When sufficient tension is attained, the prestressed steel is anchored firmly in place. d. The anchors are so designed that they are able to permanently maintain the steel cable in tension, which keeps the concrete in a state of compression. a. Here each individual steel tendon is coated with a layer of grease and wrapped in a plastic sheathing preventing steel cables from bonding with concrete. b. Once the concrete hardens, tension is transferred to it via the force created by the steel cables acting against the anchors embedded in the perimeter of the concrete slab. c. In this technique each steel cable retains freedom of movement relative to the concrete itself. This allows for greater layout flexibility as compared to other forms. a. Significantly increases the strength of concrete. 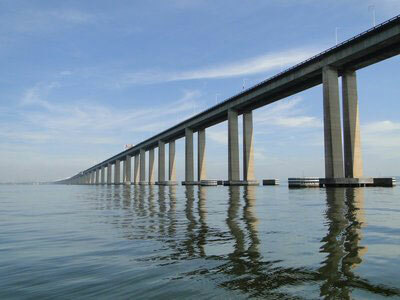 Therefore, the structures made using this process have a very low failure rate. Perform well under stress, and are much less prone to getting cracked. b. Structures can be made much more compact with high strength. Floor slabs and beams can be designed to be much thinner as compared to those made using reinforced concrete. This saves in multi-storey building construction. c. Usually, in any construction, the joints between slabs are the most high maintenance area. Using the prestressing technique, concrete slabs can be made larger, which results in lesser number of required joints. d. Large building and bridges can be built reliably using this technique. Prestressed Concrete Presentation: Click here to download this post in .ppt format.